There’s a new pattern in the Crochet Spot Store! As the title states, these slippers are adjustable! They can be made is a variety of styles for both men and women. They can be made in just about any size from babies, kids, to adults. 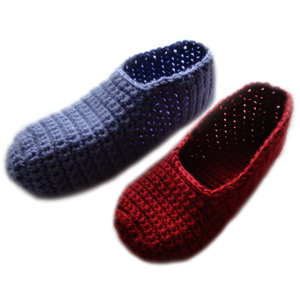 You can use any weight of yarn you like to obtain thick or thin slippers. Feel free to add your own appliques or straps to the slippers to make them uniquely yours. This pattern is not written in a conventional manner since it is extremely adjustable, so there are progressive photos that you can follow as you crochet. This entry was posted on Sunday, December 23rd, 2012 at 9:47 AM by Rachel Choi	and is filed under Best Crochet Patterns. You can follow any responses to this entry through the RSS 2.0 feed. You can skip to the end and leave a response. Pinging is currently not allowed.